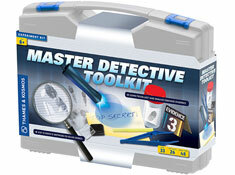 Grab this briefcase full of investigator's tools and get ready to track down some crooks! Learn about how detectives use forensic science to answer questions, gather evidence, and solve crimes. 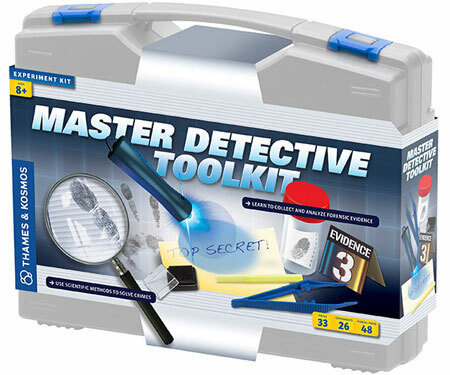 Experiment with the equipment and techniques used by real detectives to develop your own observation and problem-solving skills. First, you will set up your detective's office and organize your tools. Then, you will do some exercises to hone your observation skills. Next, you will learn about securing a crime scene, and gathering and documenting evidence, including fingerprints, footprints, and tire tracks. After you have gathered evidence, such as hair and fibers, counterfeit currency, and soil samples, you will head back to the lab to learn about analyzing it. Finally, you can try your hand at deciphering codes, writing messages with invisible ink, and communicating with secret symbols. As your detective skills develop, you can use them to solve the mock crime presented in the manual. The 32-page, full-color experiment book guides your investigations with rich illustrations and step-by-step instructions. This is an inventive, engaging way to learn real science through roleplaying in imaginary adventures.